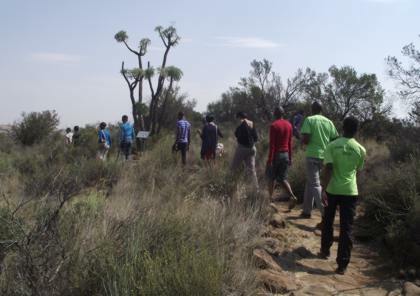 Visitors are encouraged to walk the scenic Motshetshe and Garden View trails. Both these trails reveal the beauty and diversity of the plants of the Free State. This section of the Garden is characterised by valleys and watercourses that flow sporadically. The vegetation is transitional grassveld and includes woodland on the southern slopes of the koppie. Succulents and bulbous plants form a fascinating natural garden on the rocky outcrops. A climb up the koppie for the fit and energetic is very rewarding and is usually not too strenuous as each trail route can be tackled individually. The koppie to the east of the main dam is the steepest and a bit of a fitness challenge, although a pre-school child could probably manage it. This side of the trail has a magnificent view of the dam and birdlife in summer. To walk the whole trail leisurely takes about one-and-a-half hours. There are benches at scenic spots where you can stop, rest and enjoy the beautiful views of the Garden. The newly developed Tree Route starts at the Garden entrance and will introduce you to 43 species of South Africa’s beautiful indigenous trees and shrubs. Trees on the route are clearly marked with orange labels and an information booklet is available at the Garden entrance at R20.00. The booklet includes colour photos and useful information on each tree on the route. The number on a tree’s label corresponds with the information in the booklet. The tree route is indicated on a map in the booklet with all trees marked. The aim of this self-guided tree route is to introduce visitors to some of our beautiful indigenous trees. The route is easy to follow for young and old and can be used as educational tool.